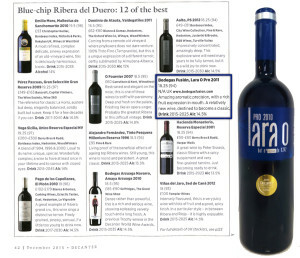 Home » Posts tagged "Lara O"
Successful year for Bodegas Fusion: Decanter magazine has positioned Lara O Pro 2011 among the best wines of the Ribera del Duero with 94 points . 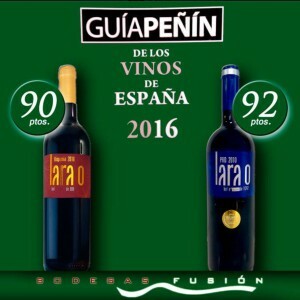 The Guia Penin rated with 90 and 92 points Lara O PRO 2010 and Lara O Hispania 2010, respectively . And Lara O Pro 2010 got the gold medal in the Decanter competition. The prestigious British magazine Decanter puts the finishing touch to an spectacular year 2015 for Bodegas Fusion by classifying its flagship wine, Lara O Pro 2011 as one of 12 best wines in Ribera del Duero with 94 points . This recognition adds up to the excellent scores awarded by the Peñin Guide 2016 , 92 points for Lara O Pro 2010 and 90 points for Lara O Hispania 2010. 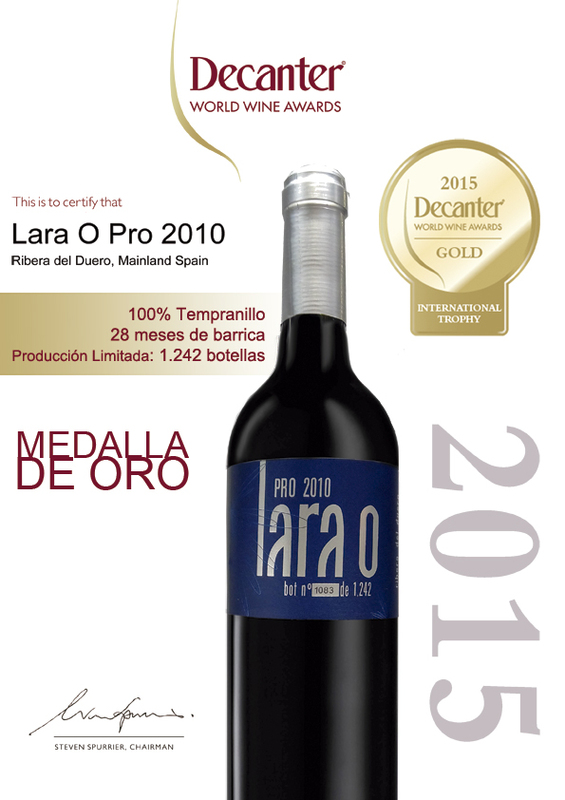 And the gold medal won by Lara O PRO 2010 in the Decanter International wine competition in May, where Lara O Hispania 2009 and Lara O crianza 2010 got silver and bronze medal. In conclusion, a year in which despite its short history, Bodegas Fusion and wines Lara O have emerged as a strong and stable market value of Spanish wines, achieving professional recognition both nationally and internationally. A golden year that rewards the dedication of this wine to elegance and excellence. 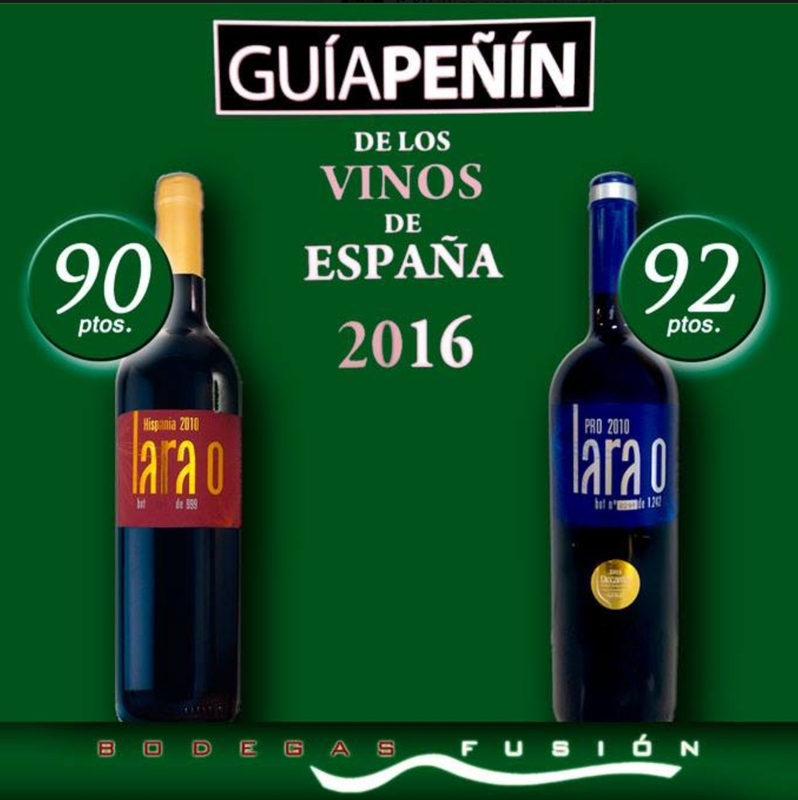 he recognized Spanish Wines Guia Peñín 2016 in its 26th edition, a reference for the industry about Spanish wines, has given the wines of Bodegas Fusion scores above 90 points, confirming the quality of its wines and positioning them among the best in its category. These superb scores consolidate the recognitions obtained this year by Bodegas Fusion, among them a gold medal for Lara O PRO in the International Competition Selections Mondiales des Vins Canada 2015 , and gold medal in the Decanter Awards 2015. Penin Guide to the Wines of Spain this year has reached this year its 26th edition with more than 11,200 brands tasted from all Spanish wine regions. It is a leader in Spain for wine professionals and consumers and is translated into English and German. The 7th May, the international magazine Decanter has awarded Lara O Pro 2010 with the top prize. This award was pleasantly welcomed by the winery and this 2010 is the first vintage produced. This wine, 100% tempranillo, is the result of the selection of the best barrels in the cellar, the most of them French; 28 months aged.Its production is very limited, and the bottles are numbered, 1242. In this 12th edition more than 15,000 samples were submitted, and include any edition gold-winning wines have never exceeded 3%. Lara O Crianza 2009 and Lara O Hispania 2010 also won medals in the competition, silver and bronze respectively. Lara O Crianza 2010 has earned a Gold Medal in Sélections Mondiales des Vins Canada 2014, www.smvcanada.ca ; silver medal at the Concours Mondial de Bruxelles 2014 www.concoursmondial.com ; and recommended wine at the International Wine Challenge in London 2014, www.internationalwinechallenge.com. 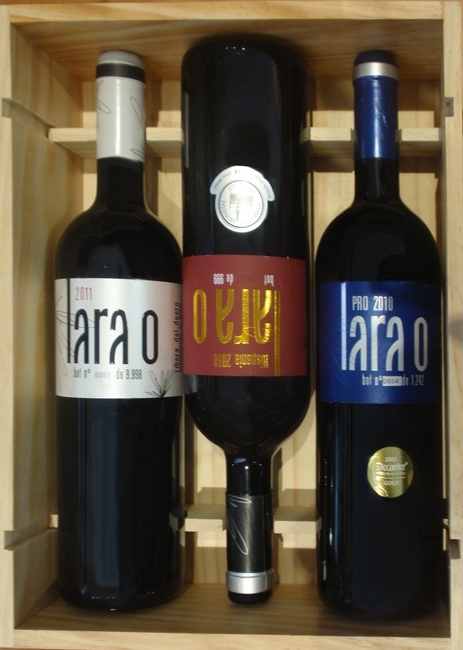 Lara O Special Selection 2005 was the first wine Bodegas Fusion put in the market, and already won two awards in two international competitions: the Gold Medal of Brussels in 2009, and Gold Tempranillo in the International Competition Tempranillos en el Mundo 2009, being fourth in its class with 91.7 points. Bodegas Fusion wants to market wines that reflect the character of the wines of our country, always made from native grape varieties such as tempranillo. LARA O Special Selection 2005, already got two international awards in 2009. Gold Medal in the Concours Mondial de Brusellex 2009 and TEMPRANILLO DE ORO (Gold Tempranillo) in the International Wine Competition Tempranillos al Mundo 2009, fourth position in its category with 91,7 points.